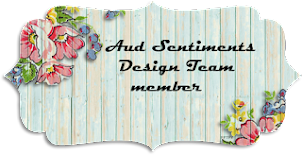 I wanted to make a nice tag and I have been looking at this dp from dcwv and so had to use it for this card. I chose a simple sentiment from Eureka. When I cut the image out I also cut the stars that were in the free Friday image.. I added them to the card in the position they were before cutting apart. I used three butterflies from Stampin up to complete the challenge theme of using 3 of something. I colored a piece of white card stock with copics and die cut them. I used some Stampin up designer papers and the sentiment is from Local rubber king. I colored the image with copics and added some wink of stella.. I added a piece of cardstock behind the card with I took my photo so it would not be washed out with the photo box I have. 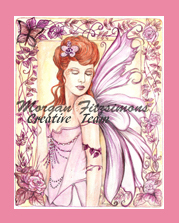 I hope you enjoy this image and check out the etsy store for Morgan's and Judy's images. 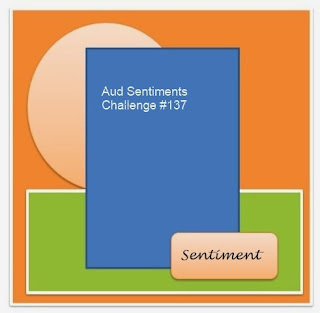 Sketch #137 You can use the sketch as it is or turn it.. You must include the sentiment on your project. 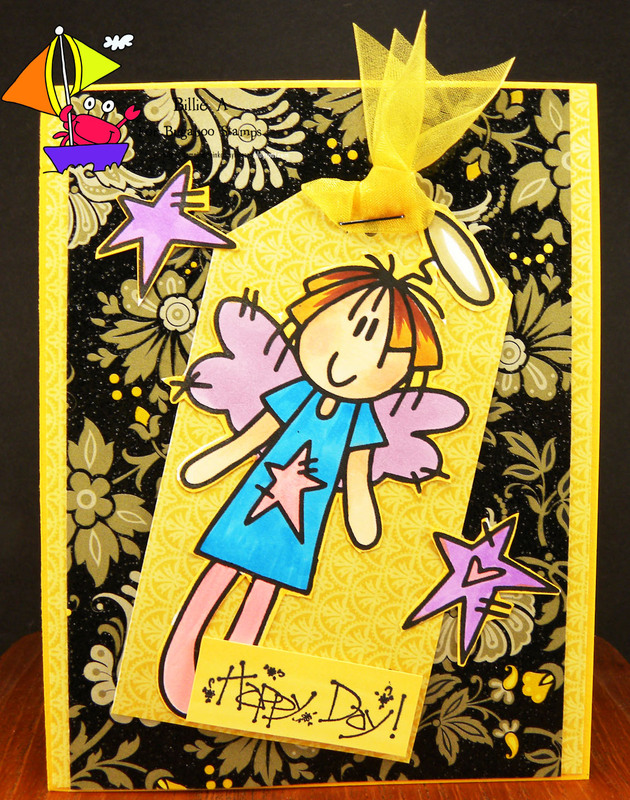 This is the card I made using Lacy Sunshine Eleanor holiday shopping.. I love pink and gray together so that is what I decided to use. I am not a traditional green and red Christmas person so thought this was a good and different color combo. Isn't she cute.. I used SU dp and card base, club scrap pink. and the sentiment is from Simon says. Oh My Goodness.. I love this image. I always have so much fun using his images. 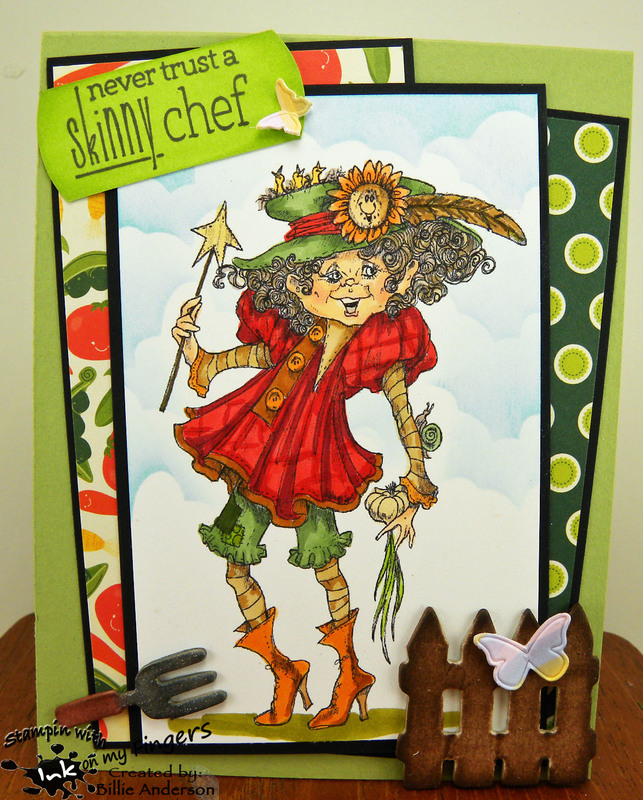 This is Garden Sprite Giggles.. I had so much fun making this card. His images are darling. I always have fun looking for colors that complement the image. I found this sentiment from Taylored Expression and thought it went well with the image. 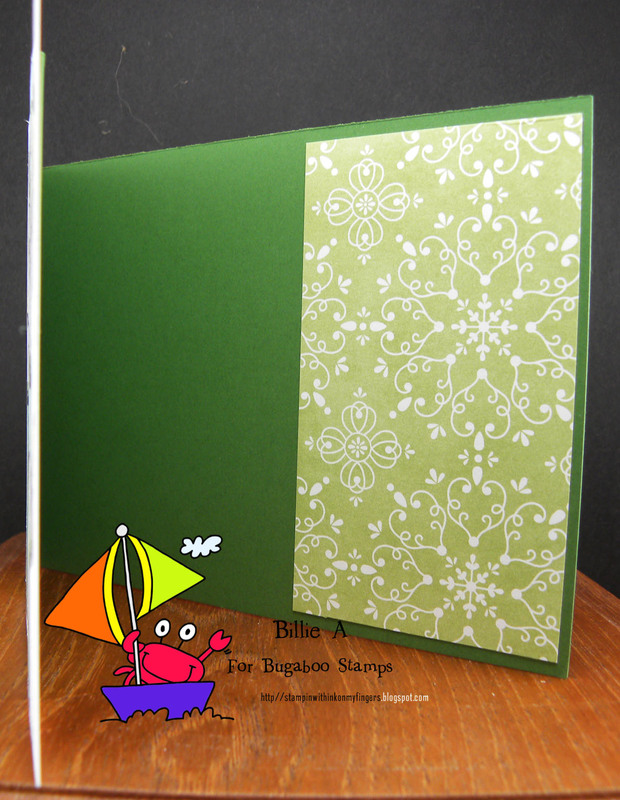 One of my favorite dp companies is cosmo cricket so I chose the garden variety pad and I also had come chipboard from taylored expressions that went well with the card. The butterflies are from SU die. I hope you come play along with us at Inspiration Destination. Ok how cute is this little girl??? Darling. SO did you hear me screeeeeemmmmm???? I had to cut apart a stamp.. 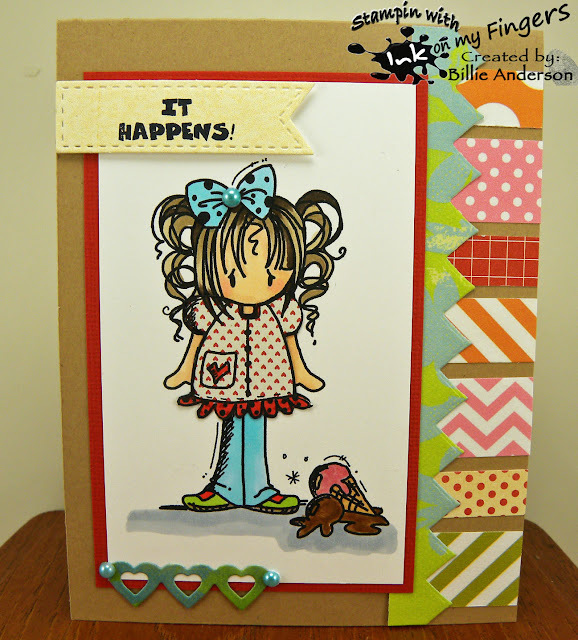 I had the tiny birthday but needed a happy.. so I did surgery and had to cut the stamp apart.. I hate doing that but it was necessary.. I wanted the balloons to be a birthday statement.. 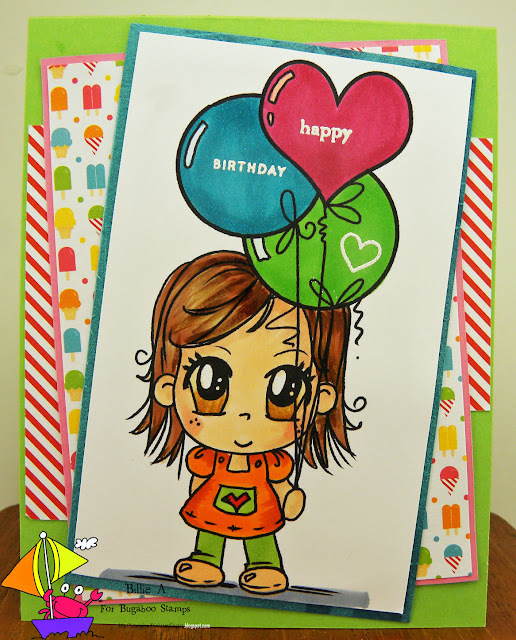 I used some bright fun colors and colored her bright colors and love the look. I got this free image from A Day for Daisies and just had to use her.. 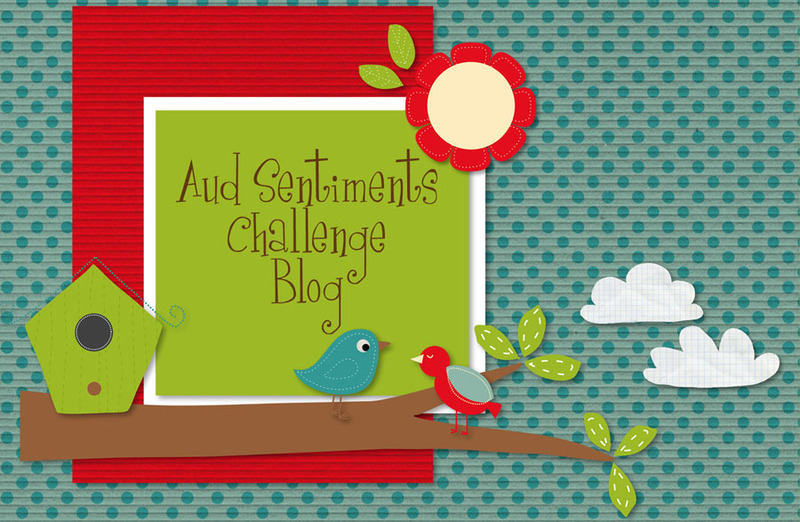 The challenge over at their blog is use newsprint.. I have an old book that I use for different cards. I sprayed it with some inks just to take the stark cream color away and then also used another newsprint to punch out the scallop pieces and used my copics and water and scrunched them up and added a bg brad to the center. I loved coloring her.. The challenge is to use this image and news print. 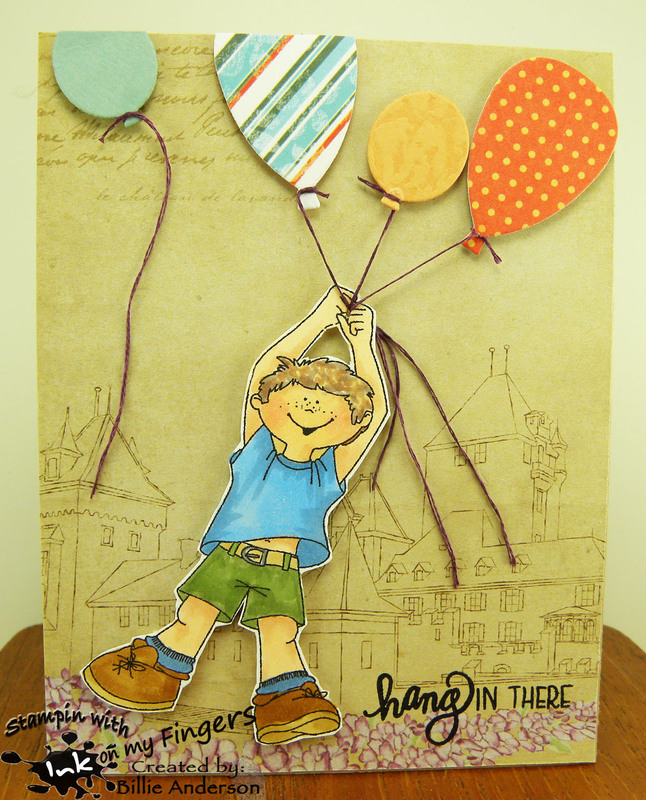 This darling image is Boy balloon holder.. I had this awesome dcwv paper and thought it would be perfect for a scene of him holding different balloons that are taking him off the ground.. I used the sentiment Hang in there and left one balloon off of his grip so it fit the sentiment a little more.. Isnt he darling. I love this image. 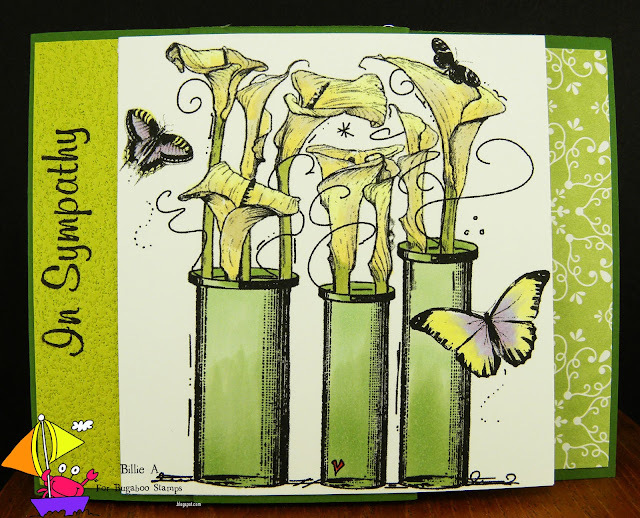 I hope you take time to play along at Inspiration Destination Ive given you a few looks at cards I made for today and hope I have inspired you. Our sponsor this week is Eureka.. 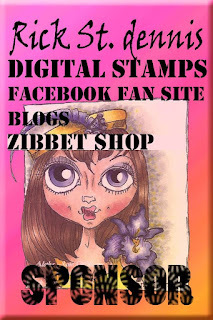 I have so many rubber stamps as I used them in my early stamping days. It's nice to see digi .. They are just as awesome. This is the image I used today called Beach girl.. 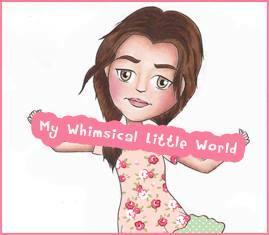 I fussy cut her out because I had this awesome dp from dcwv I only had to add the image and sentiment .. how simple is that.. 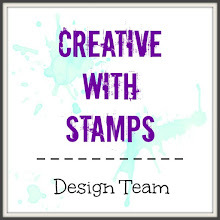 I chose to use a new stamp I got for the Simon says kit.. It was perfect for the darling image. I sure hope you head over to Inspiration Destination and play along. 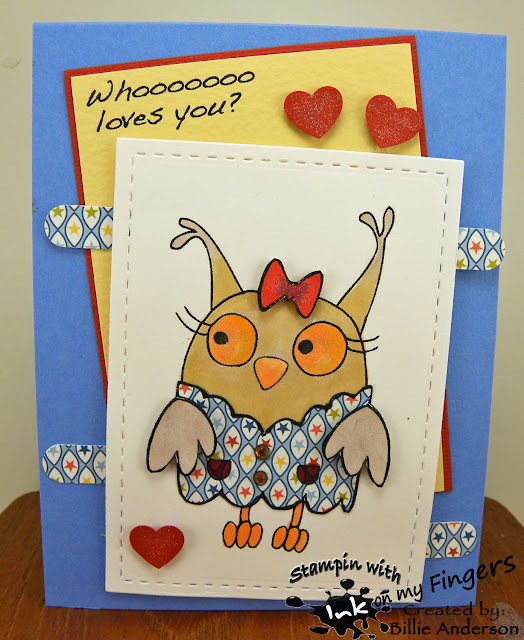 Inspiration Destination #43 - Whooooooo loves you? This cute image is Betty Owl.. I tried my hand again at paper piecing a digi.. I don't know if you read last week on my challenge of paper placement and running it through the printer .. but I did only two times this time before I got it right.. I like the layered look and I did the bow in her hair cut it out since I had an extra image to cut up from my mistake. I used wink of stella on the hearts, eyes, bow, wings.. 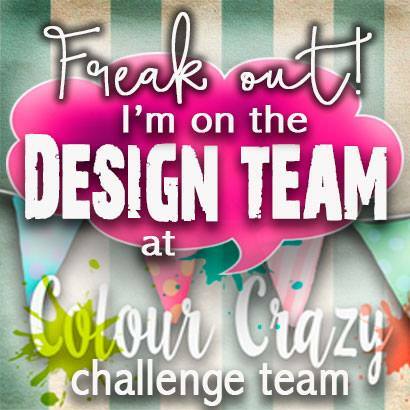 I hope you find time to play along at Inspiration Destination.. If you haven't decided to follow us.. or heck ME.. please do. I would love for you to follow me too.. Thank you. The other day when I was making my cards for babies I die cut this strip from PTI die. I did not like what I was trying to do so I put it aside. Well I was playing around and came up with this card. The hands are Inkadinkado and I fussy cut them out. I put them on a circle die from SB. Stamped congratulations from SS. 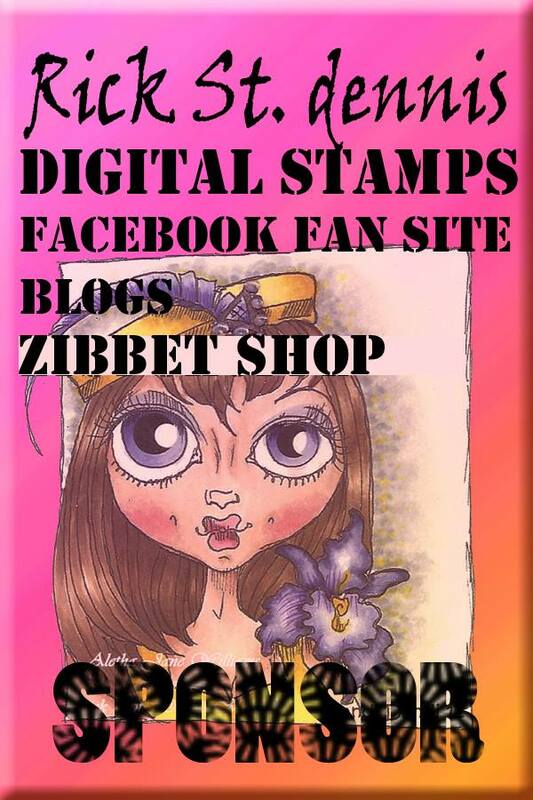 Rounded the corners with my corner chomper..
NOW I have put the stamp set away.. I am done with baby cards.. 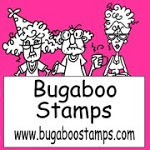 The whole month of July the bugaboo store is 50% off full price images.. This is the BINGO CARD that you need to follow. 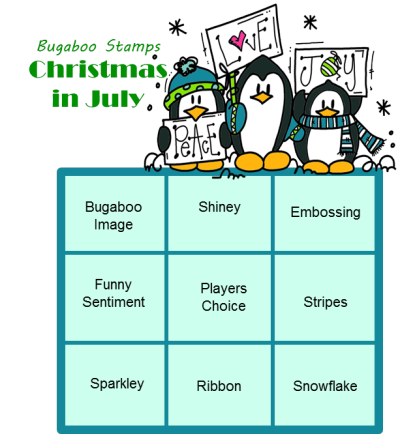 Day 7 of Christmas in July at Catch the bug and Pick up the Free image and use it on your card and pick a present for your challenge.. So this is the last day of our Christmas in July. 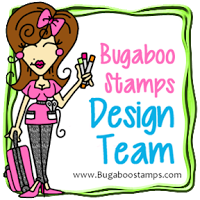 You still have time to get some cards / projects posted at Catch the bug. Hope you had fun. I sure had fun making Christmas cards and hope I encouraged you in some way. This is the free image Rudolph.. You can find him on the Bugaboo site I chose the package flower - image - button... I again went with the non traditional colors and used the awesome bloom build from PTI and added the button to the center. The circles are left over from the bloom die. I like that you don't have a bunch of bulk on the flowers because you get these center circle die cut out.. 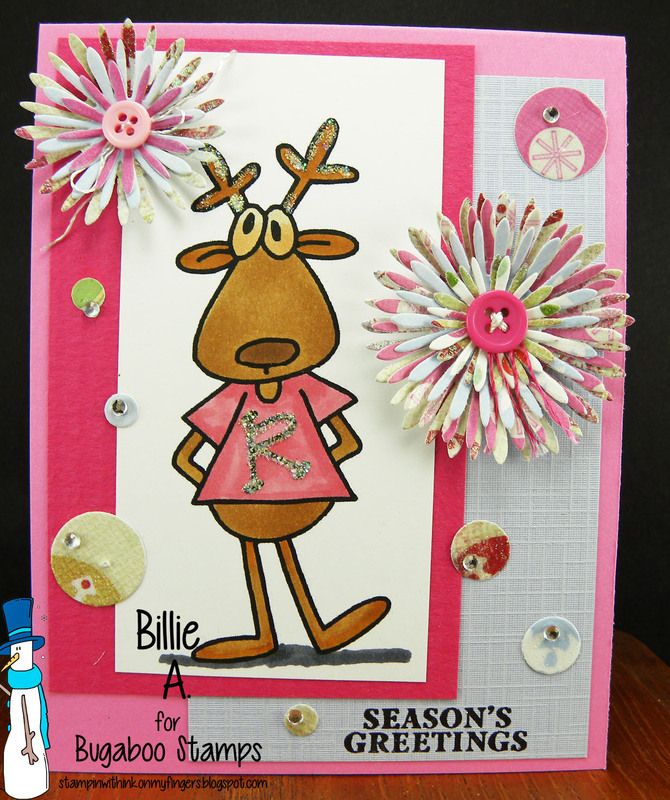 I added some glitter on her shirt "R" and on her antlers.. added some bling and sentiment.. it's done. I'm happy. 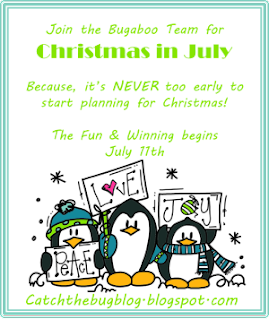 Day 6 Catch the bug - Christmas in July Oldie but good Thursday and photo challenge. 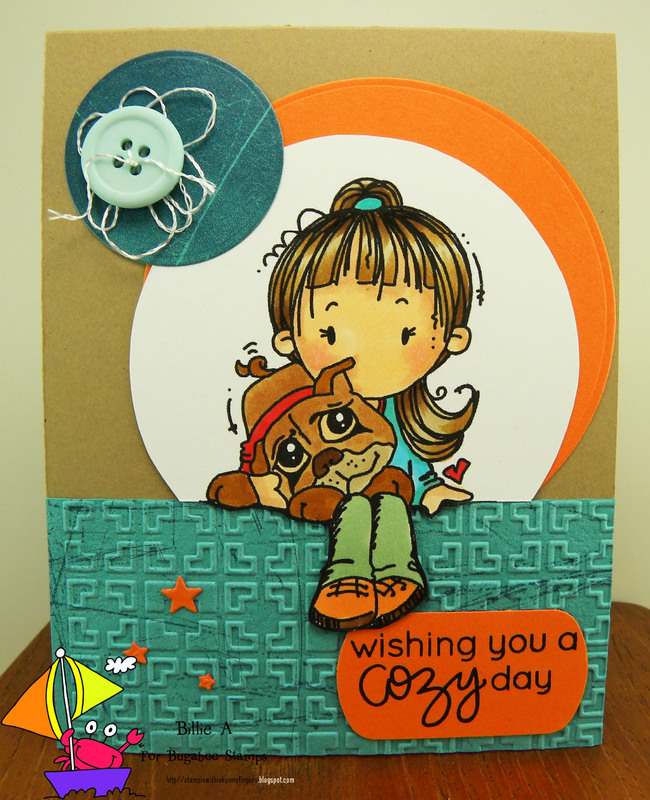 This is the card I made using the image above.. I did not realize until now that I did not even put a sentiment on the card.. I think it probably speaks for its self.. Oh well. It's the greeting on the inside that will say the most. 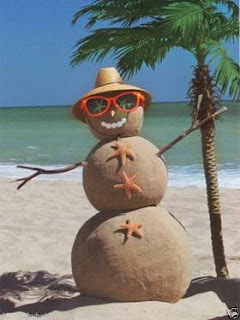 For those who are in the world that their summer is Christmas time.. this would be perfect. The card base is Kraft from the Kraft journal and the papers are dcwv, the sand is a piece of mme, the clouds are from my own cloud template. The flip flops are scraps. 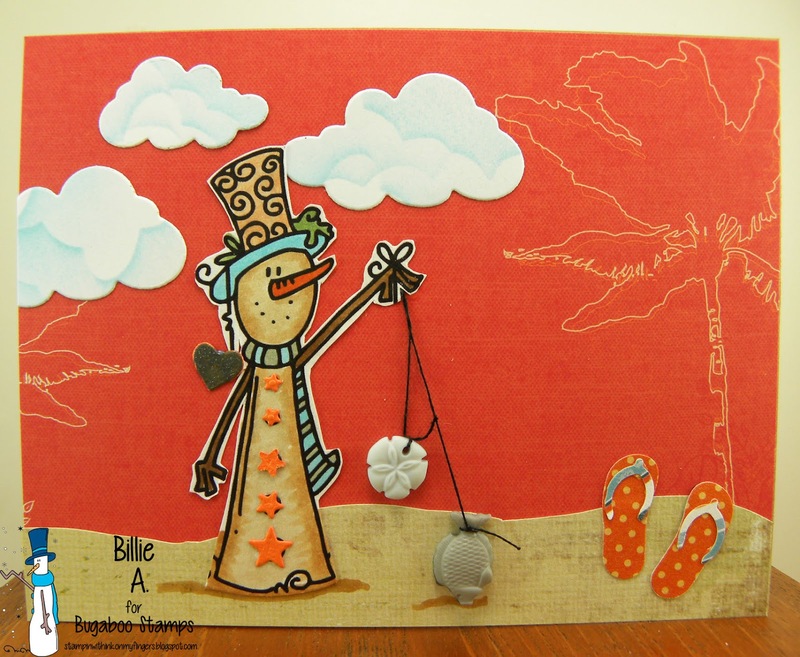 The image is Snowman bells I cut off the bells and then since it's a beach scene I added the fish and sand dollar. I had to add the flip flops to complete the beach scene. I know it's summer and hotter than ever but I just fell in love with this darling image and had to use her.. She is Honey pumpkin pie.. I really don't do Thanksgiving cards so I though this simple sentiment would be appropriate for the card come fall. I hope you play along.. 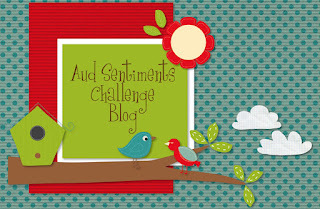 REMEMBER to add a sentiment and if the sentiment is on the inside include a photo of that sentiment.. also link back to the Aud Sentiments challenge on your blog. Just play along and have fun.. we don't have too many rules but ones we have need to be followed if you want to win some awesome images. 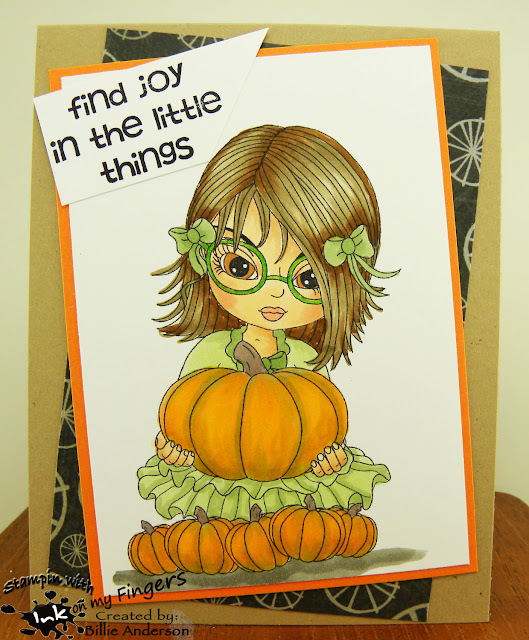 recipe: scrappers delights/honey pumpkin pie, kraft from kraft journal, dcwv scrap, su orange, su sentiment, copics. 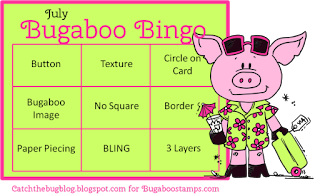 all the image in the Bugaboo store are 50% off for the whole month of July.. so hurry over and grab some awesome image..
Bingo.. you know how to play.. The did the middle pickens Funny sentiment/ players choice (buttons) and stripes. I kept this quite simple and I think it turned out cute. 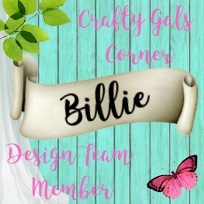 I hope you are inspired to play along and link you card to the Catch the bug site. I am using Nerdy boy.. by MWLW.. I had to hurry up and use this black and white paper because I keep it in my box of 6x6 papers and every time I pick it up or even just look at it with out touching my eyes go crazy.. it's such and optical illusion.. I don't know how it will come across on the computer but believe me if you have this paper you know what I am saying.. Any how back to the rest of the card.. 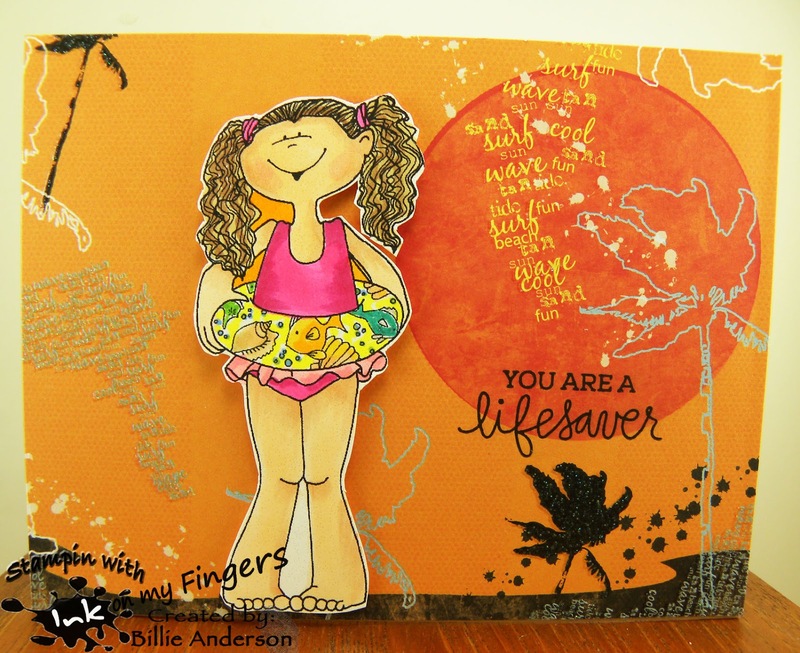 I used that paper and then needed to add a nice contrast color so chose the orange.. then I had this strip of water color piece that I cut off of a card I posted a few month back to give some other fun colors. I had some nerdy glasses.. I should of added some silver tape over the bridge.. dang why do I see things after I already have it ready to post.. ; ( ... any how I did not know what sentiment to use so I just chose a Simon says sentiment that I thought would work. 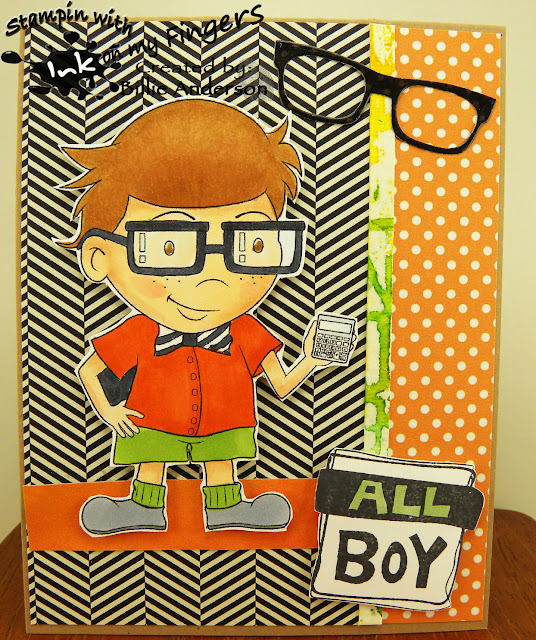 I think this image is so cute and I always need masculine cards.. Hope you play along post your card (s) over at Inspiration Destination.. Always anything goes. Inspiration Destination #42 - It happens! I am using the darling image called Wee one ice cream fall.. It happens! is a sentiment I have had for so long I don't know who it belongs to.. I think it may be rubber baby buggy bumpers sentiment.. I thought it fit the image.. Also does the 5 second rule apply??? I also paper pieced the little top she has on. I don't do paper piecing with digi's and now I know why. 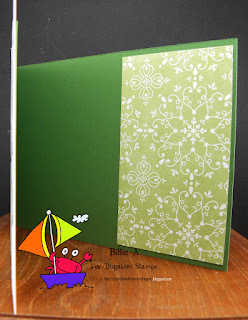 I did not know where to place the scrap paper and so I have other images with scraps that are not suppose to have them.. I finally got the scrap in the right area when I printed so she has a nice top now. 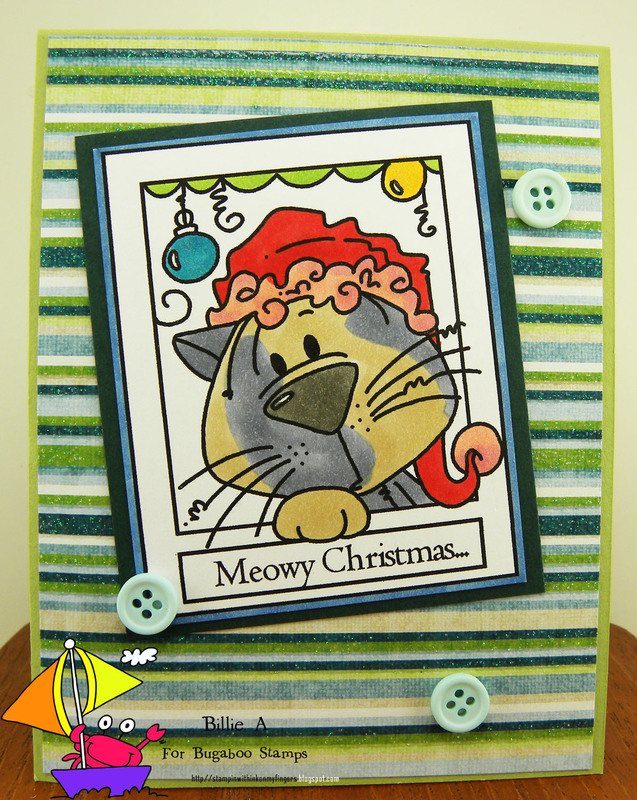 I used a lot of scraps I had on my table and some negative dies and scraps of dies to complete the card. I like the bright colors of it.. 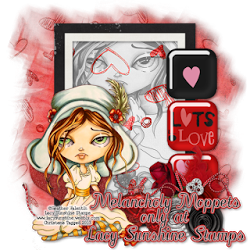 I hope you play along over at Inspiration Destination.. YOU could win some images.. woo hoo. recipe: wee one ice cream fall/bugaboo, scraps, mft die, lil inker die, te die, copics, 1/2 pearls pizzaz a plenty, wink of stella, kraft journal card stock. Welcome to day 4 of the Christmas in July at Catch the bug.. are you having fun and getting your cards posted at Catch the bug.???? hope your finding time during this busy summer to get some cards entered.. 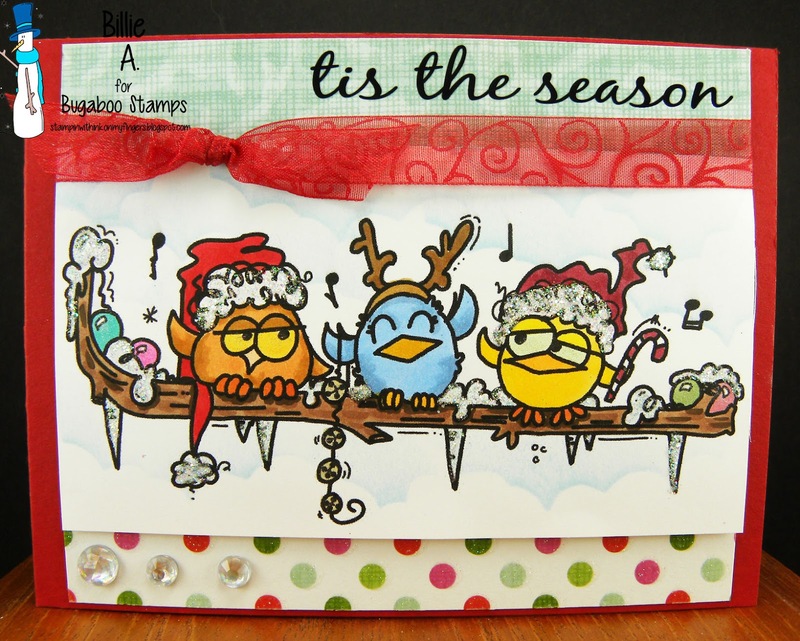 I am using the new image called winter bird trio I used the two designer papers, and the three blings at the bottom left and one ribbon. I used a rub on sentiment. I don't use them but once a year..lol. I used some glitter on the snow and just colored the birds some fun colors.